Our old friend Gliese 581 just keeps getting more and more interesting. Astronomers have discovered yet another VERY interesting planet orbiting this star. The star itself is a red dwarf- much smaller and cooler than our own sun, which mean it’s habitable zone is much closer than that of our sun. This new planet is only about 3 times the mass of earth, and it is within the star’s habitable zone! Clearly this is exciting, but it’s still not a true “earth-twin” because we have no way to determine if the planet even has an atmosphere. It was discovered the same way all 5 other planets in this system have been discovered- the radial velocity, or “wobble” method in which astronomers measure the planet’s tug on the star as it orbits. I’m assuming the planet does not line on the plane of our line of sight to the star, otherwise we’d have transit observations to go along with these RV observations. Also, because it is so close (it orbits in only about 37 days) it’s probably tidally locked. This means the planet rotates at the same rate it orbits the star, resulting the same face of the planet always facing the star, exactly how or own moon always faces us with same side. Thus, one side of the planet would be much hotter than the other, and this is big mitigating factor in the likelihood of the planet harboring life. The big deal here is simply that there is a somewhat earth-like planet orbiting a star right at our galactic doorstep. 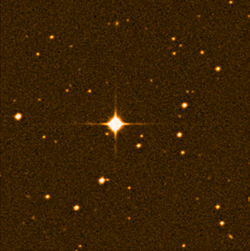 The Gliese 581 system is only about 20 light years away. Statistically, if earth-like planets were rare in our galaxy, the chances of one being so close to us would be VERY VERY low. So having one at our doorstep means that earth-like planets must be pretty common in our galaxy, VERY common, in fact. I have a strong feeling that as more data from the Kepler mission comes in, they’re going to start popping up everywhere, and that’s exciting. I could go on and on, but what I’ve presented thus far is a condensed version of the Bad Astronomy post that just went up, so head over there to get the full details. As always Phil does a great job presenting the facts in laymen’s terms. Needs to HAVE WATER H20!! !